What is the Genki Dama made of? Where does the idea for this technique originate? And why is it so powerful? By the time you finish reading this article you will fully understand the Genki Dama in a way that no else in the world ever has. It’s a long one, so I suggest brewing some tea. Perhaps oolong or puer would be fitting. What does Genki Dama mean? Genki Dama (元気玉) is a Japanese term written in Kanji and integrally connected with Daoist culture. Genki (元気) means Origin Ki and is the transliterated term for the Chinese YuanQi (元気). 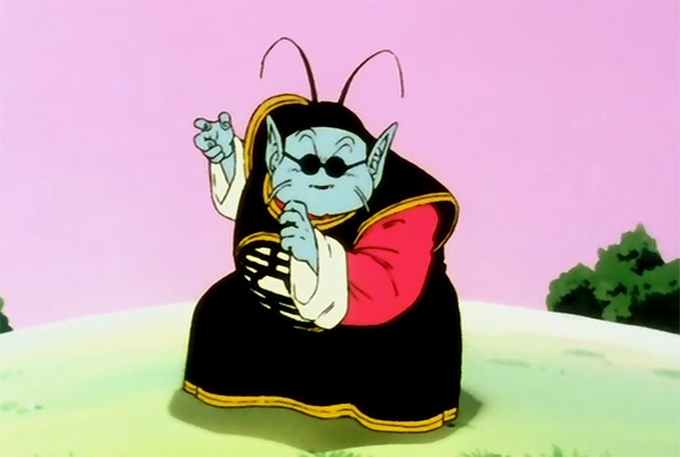 Genki is the original Ki of all matter. That is to say, matter in our world is composed of molecules, and below molecules are atoms, protons, neutrons, electrons, ions, neutrinos, quarks, gluons, and progressing infinitesimally downward to more microcosmic particles. At the very origin of all matter, in the most microcosmic realm, is our Genki. It is what lies at the core of our being, buried underneath all those many layers of particles that end with the molecules that comprise our surface body. Genki is composed of the characteristic of the universe and is virtuous and pure. It is the higher level, original, divine part of all matter, and it is extremely dense, refined and powerful. Chinese Daoist culture does not distinguish between organic and inorganic, alive or dead. All matter is both simultaneously living and dying (the rotating Taiji of Yin and Yang), and all matter is composed of the same sub-molecular components. Therefore people, ghosts, gods, demons, trees, rivers, mountains, fish, planets and stars all have Genki. Genki has another Daoist correlative with the concept of De (德), often translated as Virtue, and described as a white material substance aligned with the nature of the universe. It is the inverse of YeLi (业力), often translated as Karma, and described as a black substance aligned with wickedness. More commonly, Dama can mean ball, jade, pearl, or a round jewel-like object. In these cases it’s usually pronounced Tama. 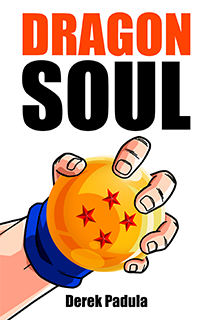 What about the localized term, “Spirit Bomb”? 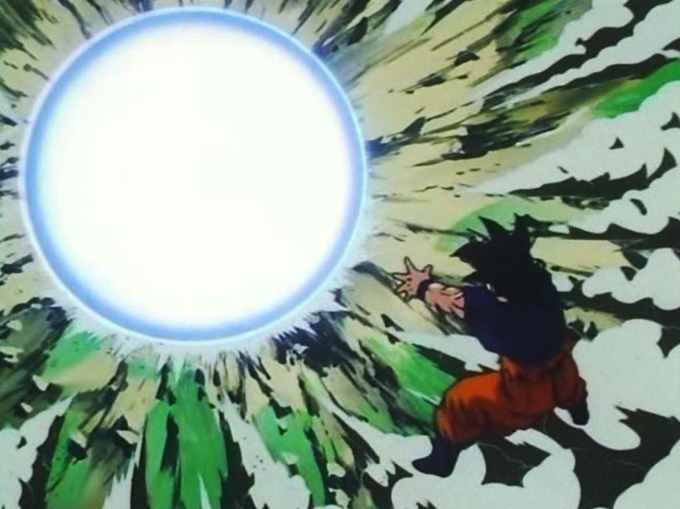 Spirit Bomb is a misnomer. Spirit could be considered a vague translation of Genki (translated from a modern Japanese expression regarding a positive attitude), but Bomb is not an appropriate translation for Dama. The technique is never used as a bomb and I don’t believe Toriyama wanted people to understand it that way. 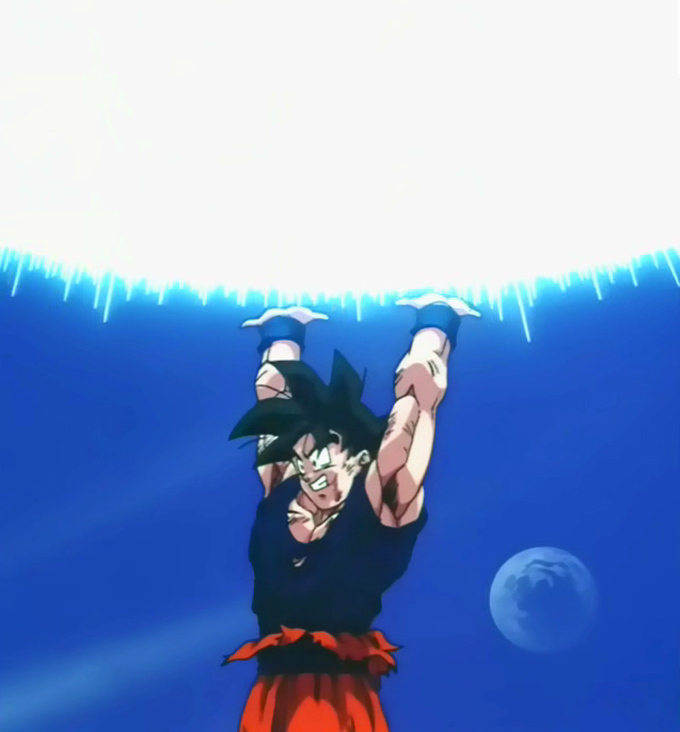 That said, I’m fine with Spirit Bomb because it’s so commonplace, but it’s important that you understand the meaning of the original techniques name. In Daoist and Buddhist cosmology there is the concept of The Three Realms (Chinese: Sanjie, 三界 Japanese: Sankai, 三界). These typically refer to Heaven, Earth, and Hell, but can also exclude Hell and thus consist of Heaven, Man, and Earth. Daoists believe that in the beginning of existence, all things were One (一). From the One came the Two (Heaven and Earth) (Chinese: Tiandi, Japanese, Tenchi. 一土 or 天地). From the Two came the Three (the realm of Man, 人). Man was born between Heaven and Earth. Flowing throughout all Three Realms is a universal life force called Qi (気), and each realm has a natural alignment. Heaven is naturally aligned with Yang Qi. Earth is naturally aligned with Yin Qi, and Man is born between them with both Yin Qi and Yang Qi. Daoist energy practices profess that the human body is considered to be a small universe: A microcosmic reflection of the greater macrocosmic structure. Since that is the case, Man naturally has varying amounts of Yin Qi and Yang Qi, and the goal of cultivation practice is to balance the Yin and the Yang, attaining harmony in the mind and body. They do this by practicing special exercises which are traditionally known as XiuLian (修行), (Japanese: Shugyo, 修行), or in modern terminology, Qi Gong (気功). By practicing XiuLian you can open up and strengthen the energy channels in the body. In these practices they start by opening up three major energy channel points. The practitioner opens all three points and is able to gather Yin Qi from the Earth through the YongQuan, gather Yang Qi from Heaven through the BaiHui, and gather both Yin Qi and Yang Qi from the LaoGong. 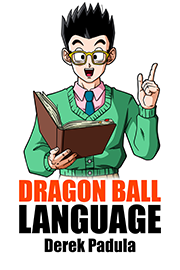 How does Goku learn the Genki Dama? In classic Toriyama fashion we never get to see the process of him learning the technique step by step. We only see him using it successfully for the first time on his last day of training with North Kaio. 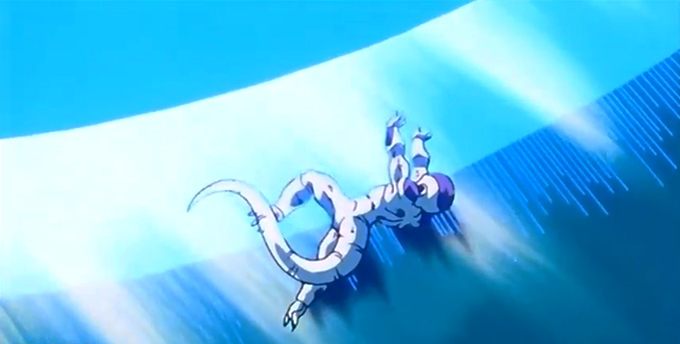 Goku had died while fighting Raditz, ran across Snake Way, and trained with North Kaio in preparation for the arrival of the Saiyans. 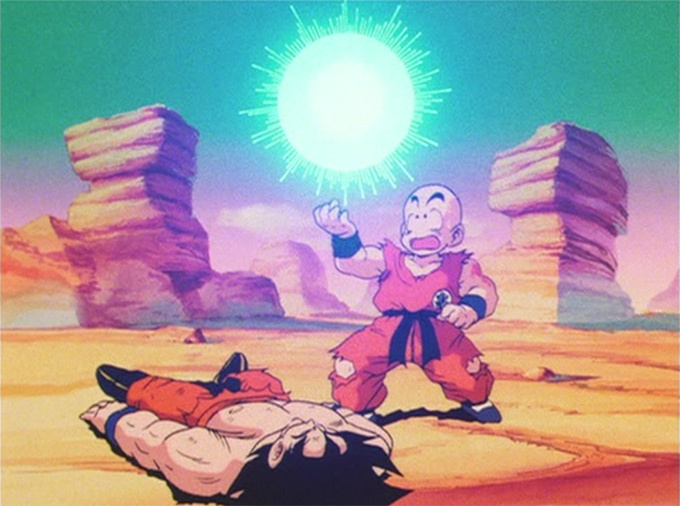 North Kaio tests Goku on his ability to use the technique in Dragon Ball Z episode 21. 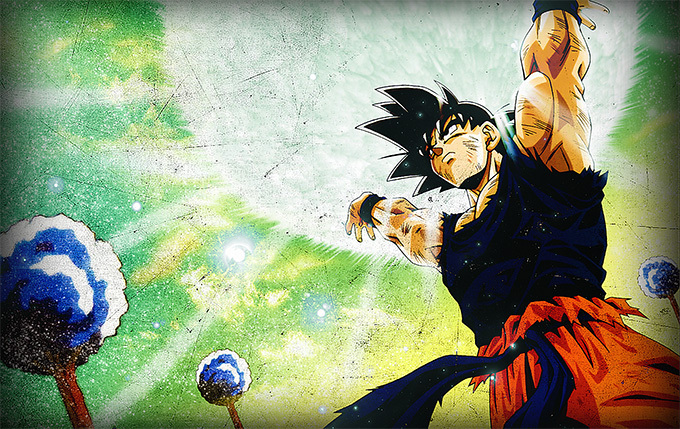 Goku enters a deep horse stance and begins to concentrate. 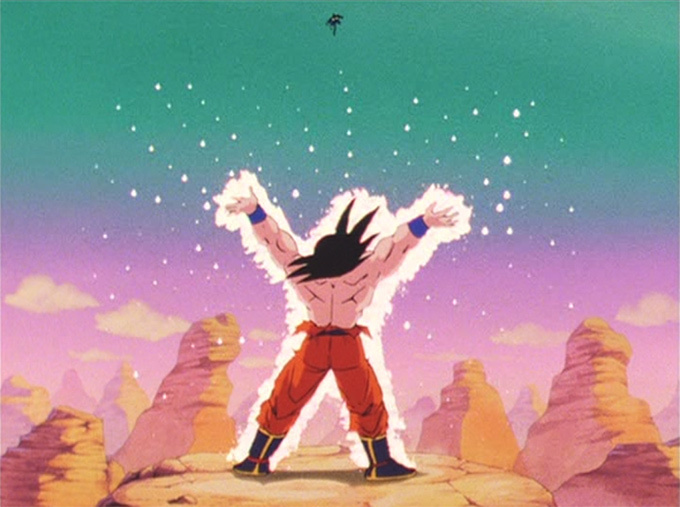 He then stands up and gathers the Genki from all over the planet and absorbs the energy into his body. White particles of light are attracted to him. Then he concentrates on condensing the energy into his right hand. North Kaio gives him a large brick-like target to throw the Genki at. 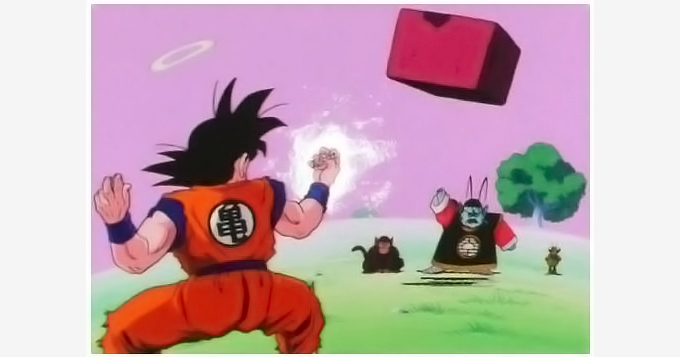 The brick travels travels at super high speed, but Goku is able to hit it with the Genki Dama and the brick explodes with such tremendous force that it uproots the trees on Kaio’s planet. That’s how the Genki Dama works. It is a collection of life energy from particles of matter that surround us, including the atmosphere and the Sun. Then the particles of this Genki (The Origin Qi at the root of all matter) are automatically drawn to the center of Goku’s body, like a vortex or magnet. They go inside the microcosm of his body and he condenses it into a ball and projects it out of his hand with his mind. What’s most impressive is that Goku doesn’t just gather the Yin Qi and Yang Qi. He gathers the Origin Qi, the Genki. 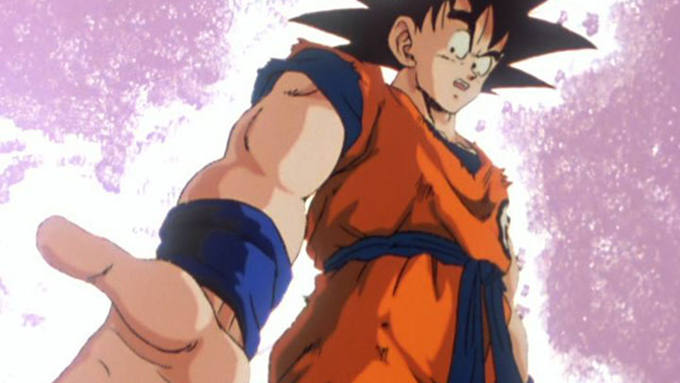 The larger the expanse of Goku’s mind and the more matter he can connect with, the more powerful the Genki Dama becomes. North Kaio (Japanese: Kita no Kaio, 北の界王) is (as described) the Kaio of the North. There are three other Kaio’s for East, South, and West. Kaio (界王) is the combination of Realms (界) and King (王), often translated as the Lord of Worlds but just as fitting to translate as King of Realms. 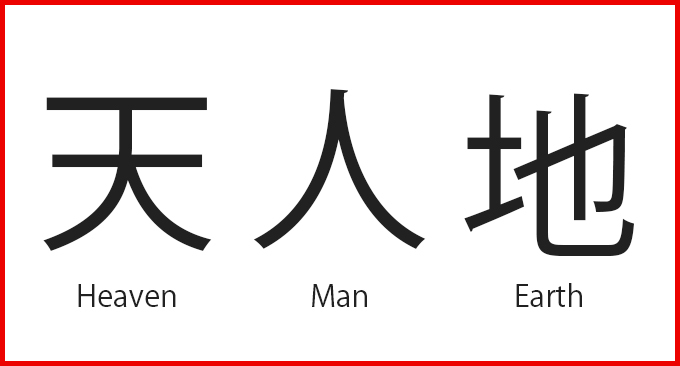 The character for King (王) is the same as Dama (玉) without the extra stroke at the bottom right. In Chinese culture a King is believed to be a divine inheritor and enactor of the Will of Heaven, and he stands as upright and tall as a column, reaching from Earth to Heaven, and back again. It is fitting that North Kaio (of all Goku’s masters) would be the one to teach Goku the Genki Dama, since he is teaching Goku how to expand the broadness of his mind to reach across entire realms and worlds, to serve as the bridge between Heaven and Earth, and gather Genki from all forms of matter. In other words, to become the living embodiment of the Will of Heaven: the Man who wields the Essence of Heaven on Earth. The Genki Dama. How does Goku use the Genki Dama in battle? 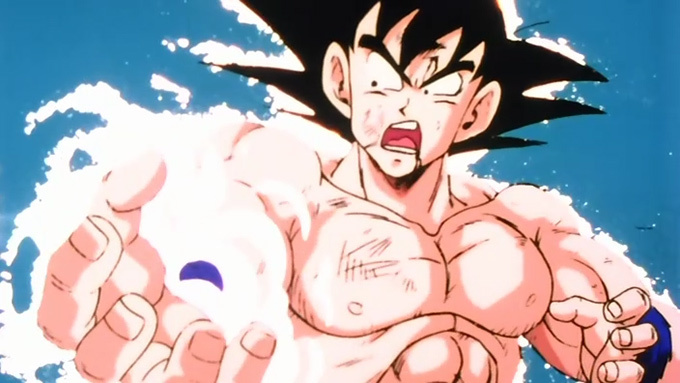 Goku uses the Genki Dama for the first time in Dragon Ball Z episode 32. He is in a life and death battle with Oozaru Vegeta, and he buys himself some time by blinding Vegeta with the Taiyo-Ken (Solar Flare). 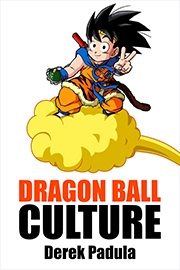 Goku then uses the Kaio-Ken to fly away and land on a small platform of earth. “All right… At this distance…” He spreads out his feet, calms his breath, and pacifies his mind, with a smile on his face. He closes his eyes and begins to gather the energy from across the world. 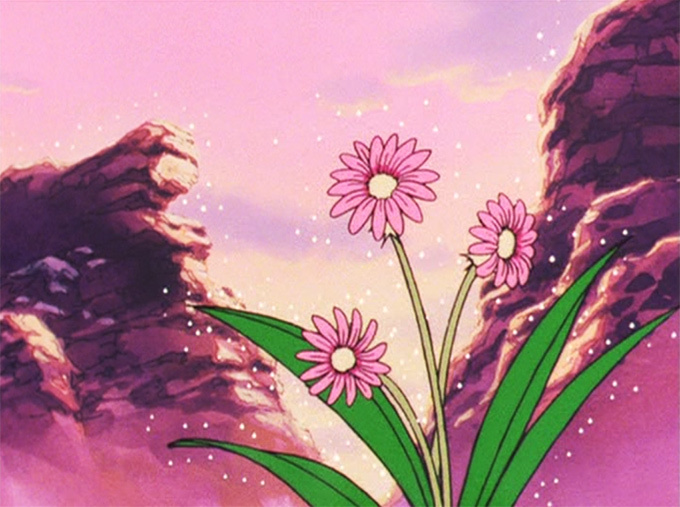 Genki from flowers, mountains, forests, lakes, all emit white particles of light that gather onto his body. Genki from the seas, rivers, fish, and all the land fly toward Goku’s body. 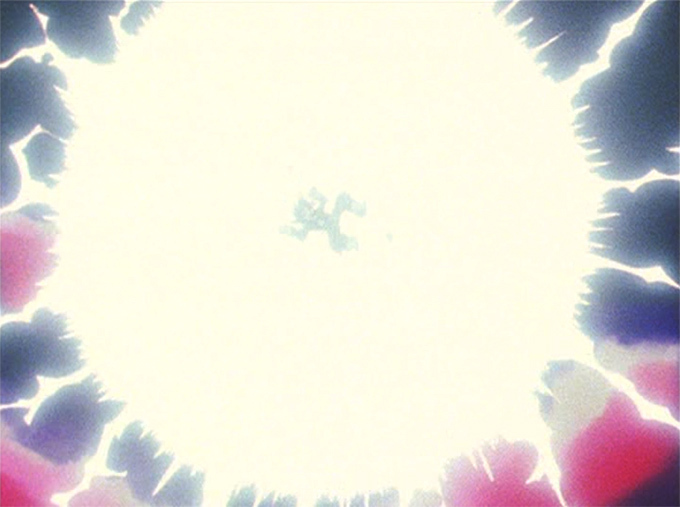 Vegeta regains his composure and spots him, and Goku finishes the Genki Dama just in time. 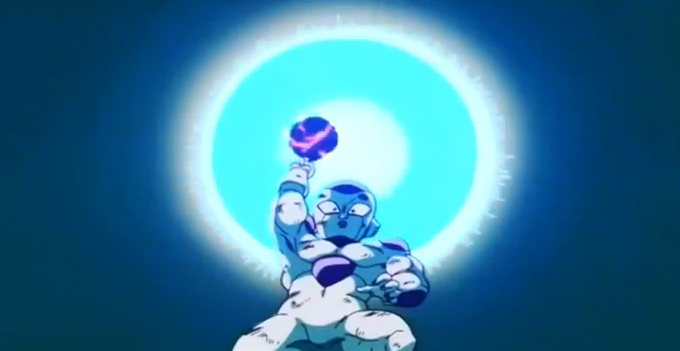 He concentrates it into his right hand and gets ready to throw it at Vegeta, when all of a sudden…! 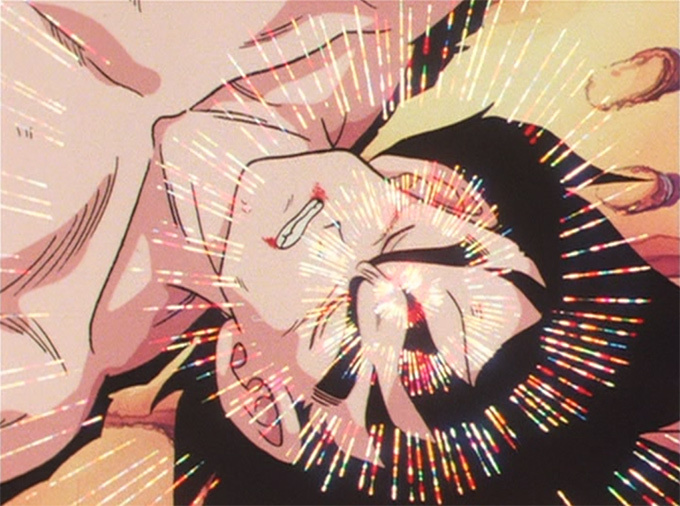 Yeah, Vegeta hits him with a giant mouth blast. Whoops! There goes the Genki. Goku later gives the small remains of the Genki Dama to Krillin and he is absolutely shocked by its power. Goku says. 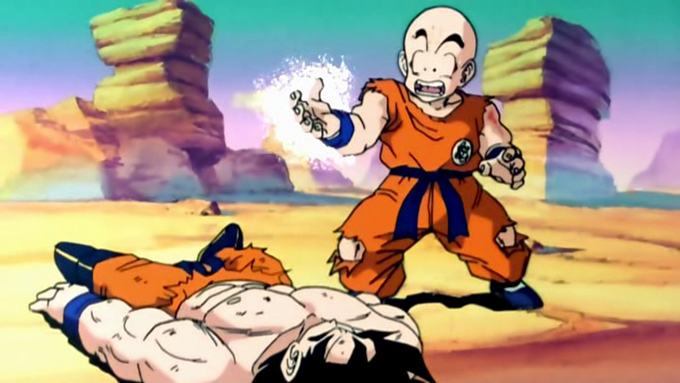 “Krillin, take my hand.” Krillin replies, “Your bones are broken, aren’t they?” “Don’t worry, just hold on. I’m going to give it to you now, okay? 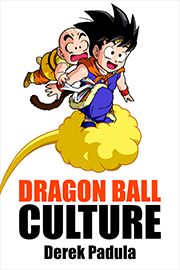 Goku transfers the Genki to Krillin. 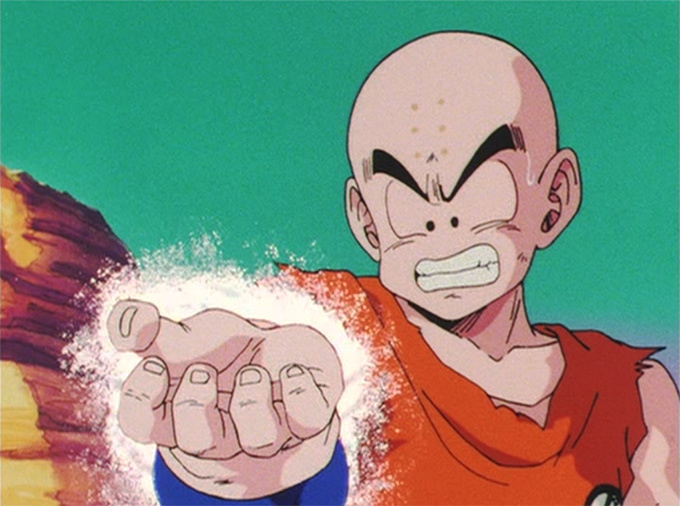 Krillin concentrates and forms the ball. 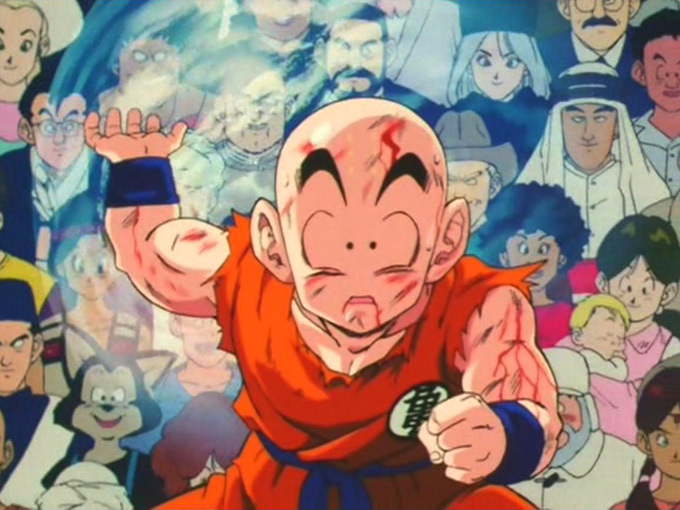 Krillin is the only character aside from Goku who was given the responsibility of holding the Genki Dama’s energy and using it properly. “Everything will be decided by your one shot. 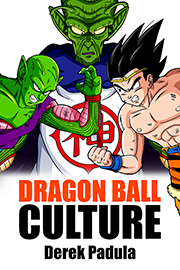 Know that the ball of that Genki Dama is filled with the hopes of the whole Earth.” The collective will of all the world’s people. This also implies that Goku uses the Genki Dama in the same manner, by locking on to evil Ki as instructed by North Kaio. But when Krillin mistimes his throw of the Genki Dama at Vegeta it heads directly for Gohan, who is pinned up against a mountain side wall. Goku telepathically connects with Gohan’s mind. The Genki Dama should not hurt a pure being who is aligned with the characteristic of the universe, although it still can depending on its size and power. This is why it can also destroy planets. Given the size of this Genki Dama, when Gohan holds out his hands to deflect it, it knocks Gohan backward but bounces off his hands and conveniently hits Vegeta instead. Let’s take a moment to examine the Genki Dama’s external technique. Goku begins by separating his feet. He goes into what is considered a classic Wuji posture, where feet are about shoulder width apart and the body is upright but relaxed. Wuji (無極) is the inverse of the Taiji (太極). Where Taiji represents the two Cosmic Extremes of Yin (Earth) and Yang (Heaven), Wuji represents the union of both Yin and Yang, and the state of Oneness before their separation, also referred to as the State of No Extremes. 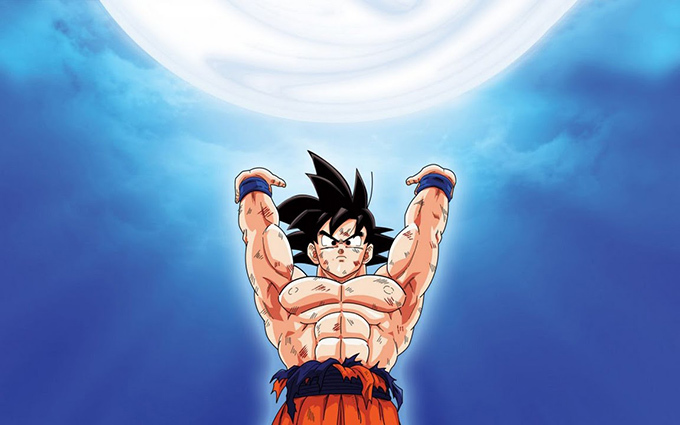 Goku’s Genki Dama stance (essentially the Wuji stance) where he connects to both the Earth (Yin) and to Heaven (Yang) allows him to gather the Genki across space and time and collect it on his own body. 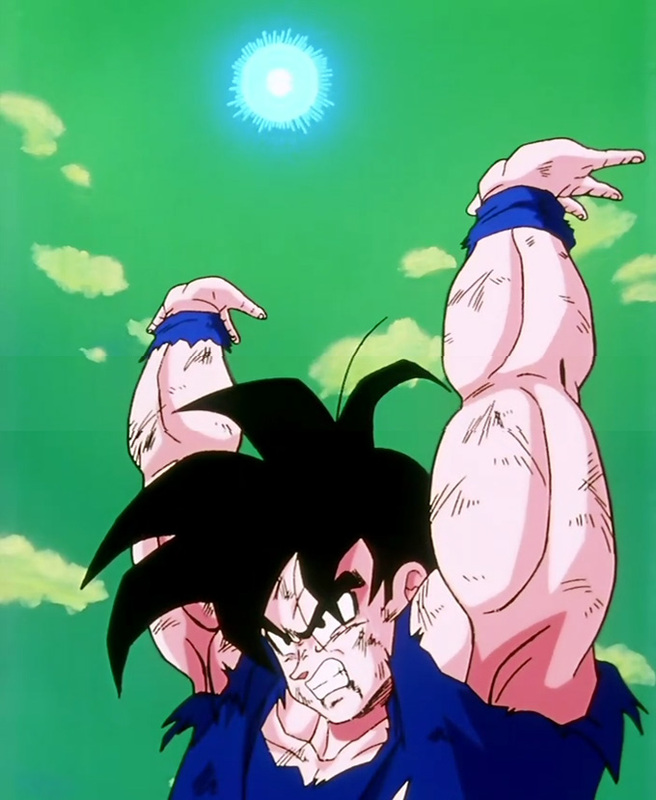 What’s unique about the Genki Dama is that Goku’s hands are placed far above his head and his arms are spread wide open, with his palms up and open. This is the most open yet relaxed and stable stance possible. This is a very high level stance that is designed to create a high frequency vibration within the practitioner. 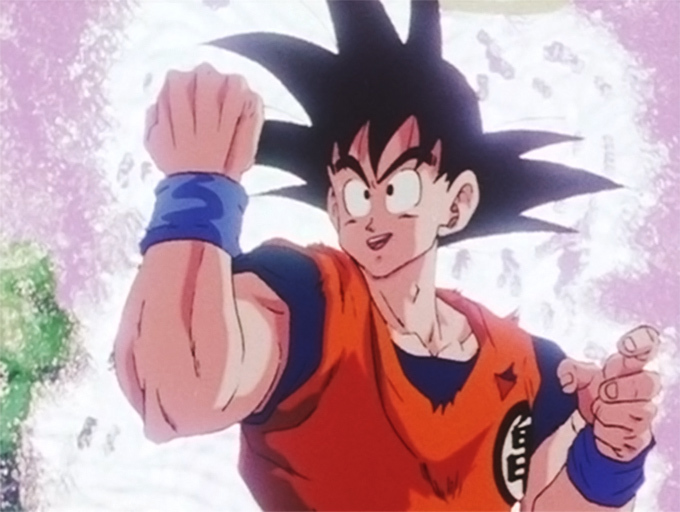 Most Qi Gong standing stance exercises place the arms at the chest level or below, but Goku’s high and wide stance immediately shows how powerful this stance really is. The endurance and concentration required to perform this stance would have to be equally high. This is not a standard technique that just any practitioner can learn. It is still, it is subtle, it requires incredible breadth of mind, an absolutely pure heart, and exceedingly deep concentration. 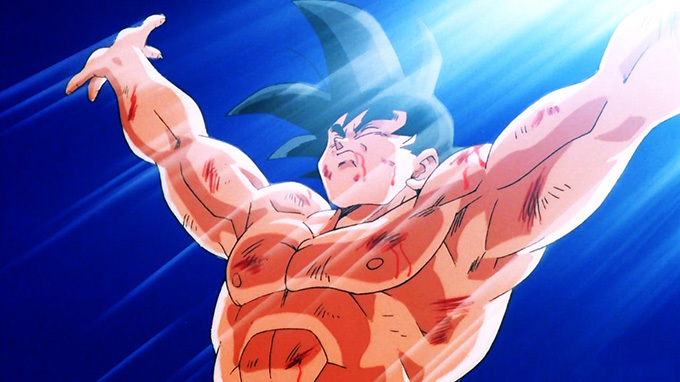 Goku had to die and undergo intense physical and spiritual training with a higher level deity in Heaven to learn it. 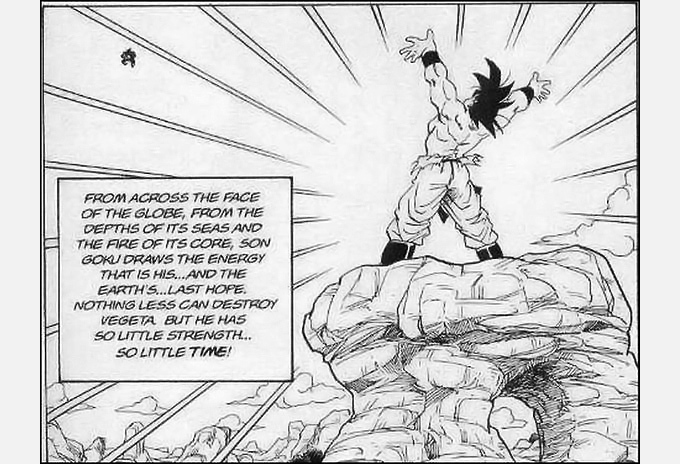 Then Goku calms his mind, connects it with all matter around him, and the energy begins to flow. He has to align his own mind to that of the characteristic of the universe at the most sub-microscopic realm. That is to say, in order for his body to accept the Genki, he has to align himself with the Genki. This means the only way a person can handle the Genki Dama properly is if they let go of their many attachments and have an empty mind. With each attachment let go, the concentration deepens and the openness expands. 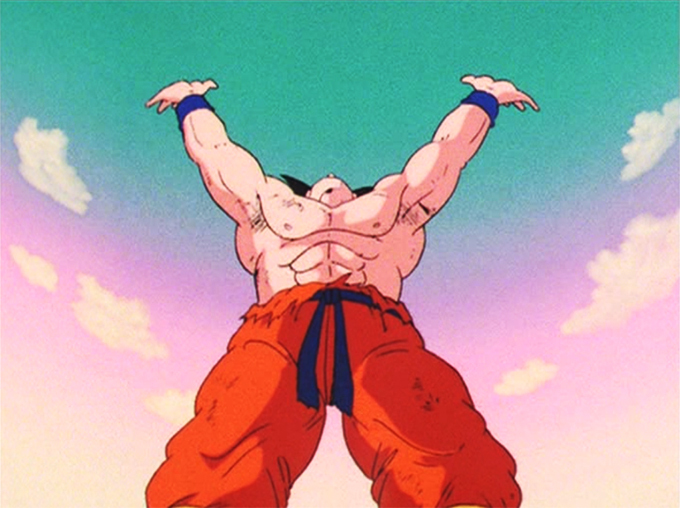 North Kaio even says in Dragon Ball Z episode 21, “That guy must have bottomless strength! And yet, his heart is clearer than crystal. To think that there’s a guy like that in the Lower Realm.” Lower Realm (Japanese: Tenka, 天下) meaning “all that is below Heaven,” which includes Earth and the many planets in his dominion. That’s the kind of guy Goku is, and it’s the reason he’s the only one who ever learns the Genki Dama. Where does the idea of the Genki Dama stance come from? As described, the concept of standing tall between Heaven and Earth originates in Daoist (and Buddhist) mind-body exercises. There is a metaphysical purpose for these stances and their inner meaning is profound. As such, there are ancient precursors to the Genki Dama that not only served a similar purpose, but also bear a resemblance. For example, the “Lifting the Sky” posture found in the 8 Step Brocade Qi Gong exercises taught by Bodhidharma, the 28th Patriarch of Buddhism, and the (often debated) teacher of Shaolin. The difference is that Goku’s hands in the Genki Dama stance are more open. There’s also the Arhat Holding up the Sky Stance. 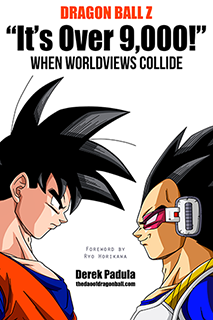 Here the difference is that Goku’s legs aren’t bent, and his arms are closer in. Neither of these is a perfect match. 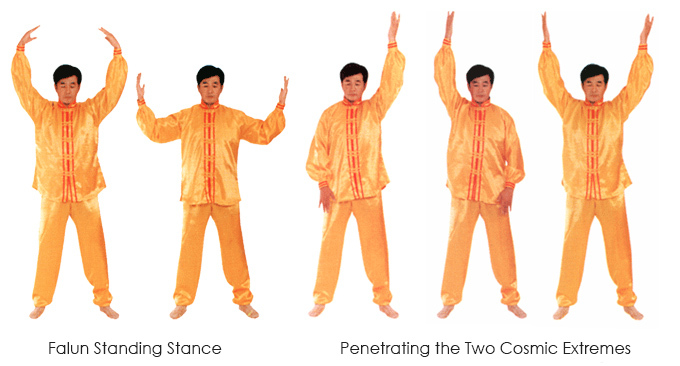 Standing meditation exercises are common in Qi Gong, but there are few that look like the Genki Dama. To find a modern equivalent I scoured the Internet for weeks and even contacted professors of Daoist studies. The only examples available come from Falun Gong meditation (which I also practice). 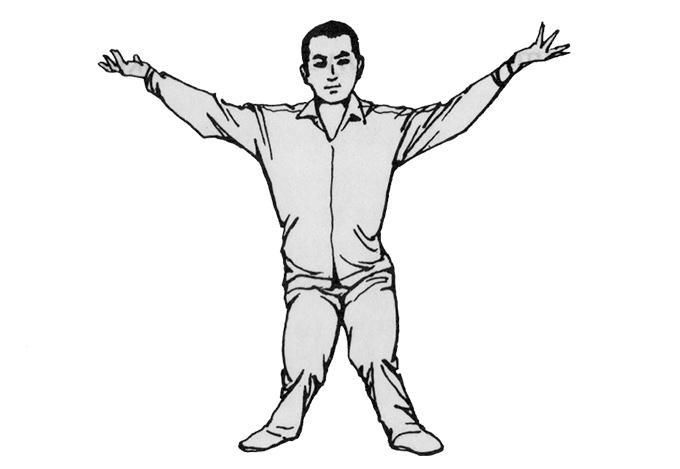 The first is called the Falun Standing Stance. It is a wheel holding exercise that opens and strengthens the energy channels. Practitioners hold each position for an extended time and attain a dynamic stillness. The second is called Penetrating the Two Cosmic Extremes. It is a standing meditation that circulates the Qi of the body from one cosmic extreme to the other (from the Heavenly zenith to the Earthly nadir), purifies the mind and body, and balances the Yin and Yang. I’ve looked for examples in other practices, but I couldn’t find any that raise the hands above the head. The Genki Dama is the counterpart to the Kaio-Ken (界王拳), both of which are taught by North Kaio. They are opposites of one another and are correlatively linked. Where the Genki Dama is broad and expansive, and requires a peaceful and empty mind to enact, the Kaio-Ken is narrow minded and rage filled, requiring endurance and intense focus. 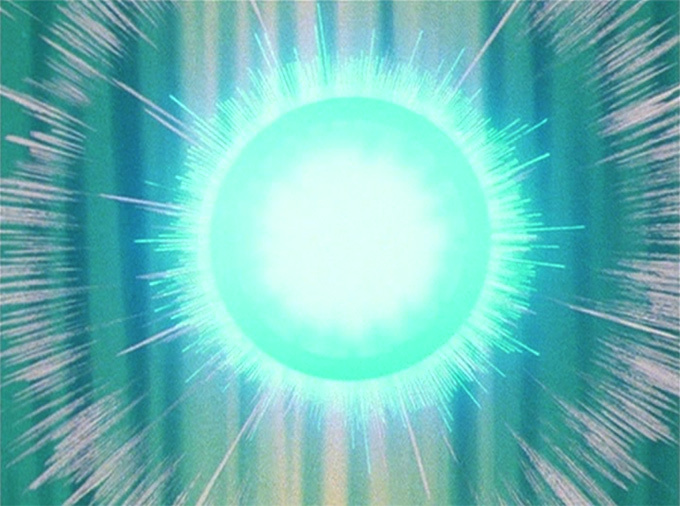 Where the Genki Dama gathers energy and draws it into Goku’s body, the Kaio-Ken quickly expels the energy in every one of Goku’s cells and microcosmic dimensions of particles, for short and intense bursts of power. Where the Genki Dama is white (with blue exterior), the Kaio-Ken is red. The idea of “opening” and “closing” or “drawing in” and “pushing out” are also derived from Daoist Taiji and Qi Gong practices. Millions of practitioners do this every single day in the parks of China, and it has become an increasingly common sight in the Western world since the 1980’s, during the Qi Gong boom. You see them moving their arms and legs, or standing peacefully, while gathering and expelling energy. Some practices specifically gather Yang Qi from the Sun, or pull Yin Qi from trees. 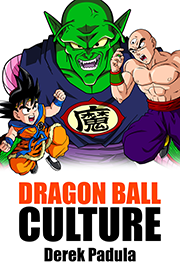 Dragon Ball Z takes this to the extreme with Goku, who likewise opens and closes to the extreme, drawing in massive amounts of energy, and expelling massive amounts of energy. 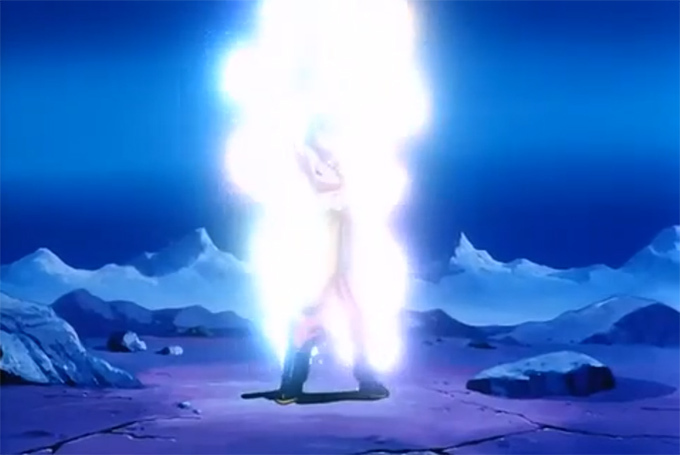 With these two types of techniques, one of extreme opening and the other of extreme closing, Goku becomes a nearly unstoppable warrior. 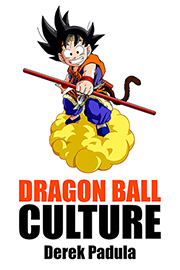 As if the regular Genki Dama weren’t awesome enough, it continues to become more powerful as Goku rises up the Shugyo ladder of self cultivation. 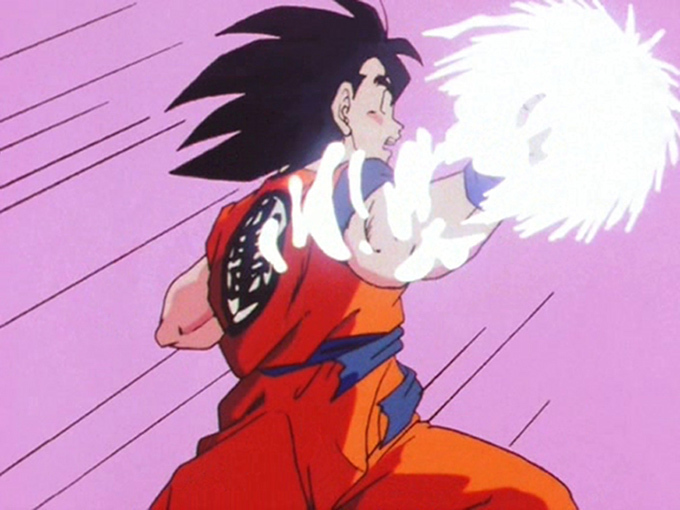 The first Genki Dama is the one where Goku collects energy from other beings directly onto his body, forms it into a ball and throws it as a projectile weapon. Goku used this type of Genki Dama against Vegeta, as well as Dr. Wheelo in The World’s Strongest film, and Turles in The Tree of Might film. But there’s another type of Genki Dama that is even more powerful. The second is where he forms the ball above his head and the ball becomes increasingly large as more energy is gathered. The ball is so large that it is dozens or hundreds of times larger than he is. Perhaps this is out of necessity, as his body would not be able to gather enough energy all by itself, and contain it for such a large amount of time. 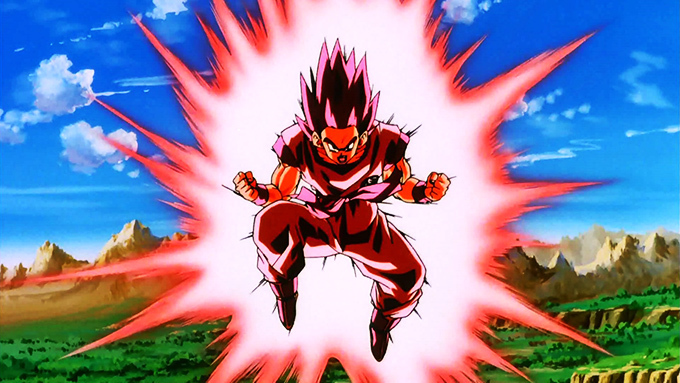 He used this type of Genki Dama against Freeza, Majin Buu, and others in the Dragon Ball Z films and the GT series. It is now this Genki Dama that most often comes to mind, even though it isn’t the original. 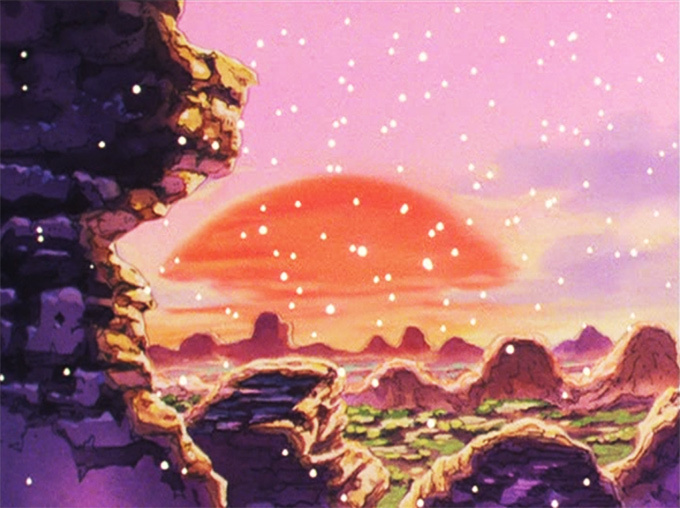 Goku connects his mind with all living and non-living beings within a certain amount of space and collects their energy. 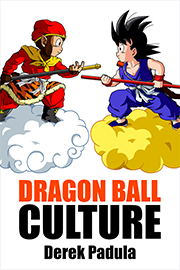 As Goku’s cultivation level rises his mind becomes increasingly expansive. With each level of ascension, his sphere of influence expands, reaching so far that he can connect with beings on other planets and even in other dimensions (Heaven and Hell). When the energy from this type of Genki Dama is gathered, it tends to exhaust the people or animals that the Genki is drawn from. To point, North Kaio tells Vegeta (who was instructing the Earthlings to give Goku their Genki) that if he takes the Genki from them again, they will die. This correlates with the idea that Genki is at the very core of our essence. Daoists believe that if your human essence is drawn out or stolen, your life will be shortened. If it is eliminated, it will cause immediate death. Conversely, if you can maintain your essence, your life will be extended and you will eventually attain immortality. Why did the Genki Dama work against Majin Buu when nothing else would? Because the energy of the Genki Dama is so microcosmically refined and so incredibly dense that it reaches into the subatomic level at Majin Buu’s physiological structure and obliterates it completely. No other form of energy was microcosmic enough to reach that dimension. Neither Goku’s Kamehameha, nor Vegeta’s self destruction technique, could do the job. And then there’s the middle ground where Goku gathers a Genki Dama above his head and then pulls the energy into his body. We only see this in Dragon Ball Z movie 7, where Goku is fighting the Artificial Humans. 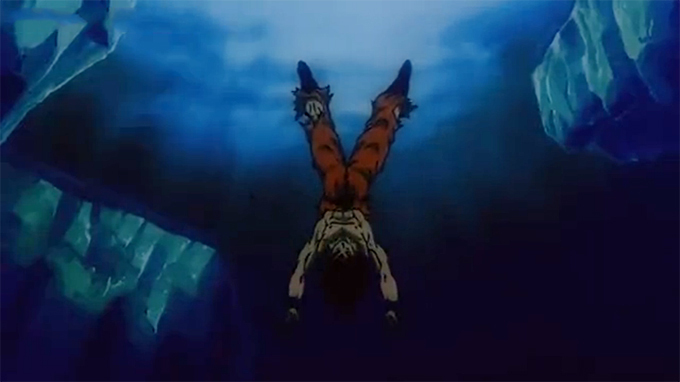 First of all, Goku starts this Genki Dama upside down, under water, in a frozen lake, after a violent beating. 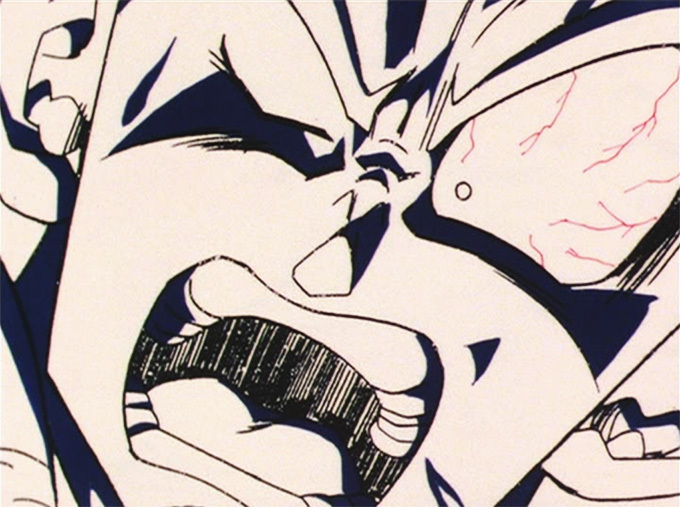 To make it even more incredible, Goku becomes a Super Saiyan as he draws it in. This is amazing because given the amount of intense rage and narrow minded anger that being a Super Saiyan requires, (which is the opposite of the broad mindedness associated with the Genki Dama and necessary for it to be used) you would think it’s impossible. But somehow Goku manages to do both extremes at the same time (the Wuji), threading the needle in the middle of a life and death situation. He pulls the Genki Dama into his DanTian. 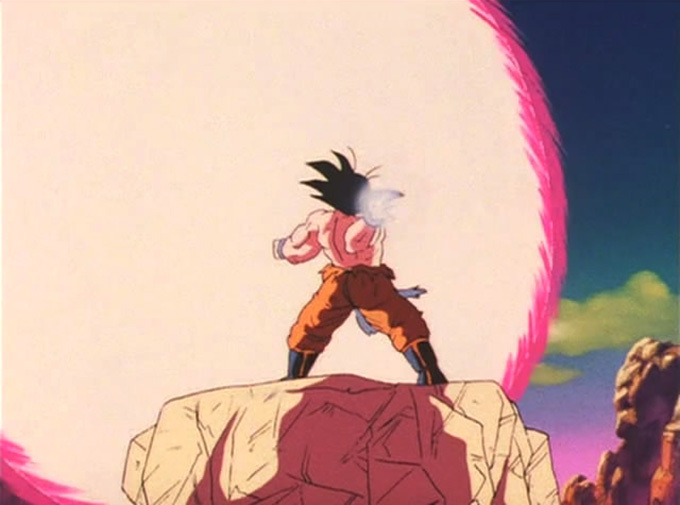 The energy of the Genki Dama fills his body and the giant energy sphere around his body turns golden. 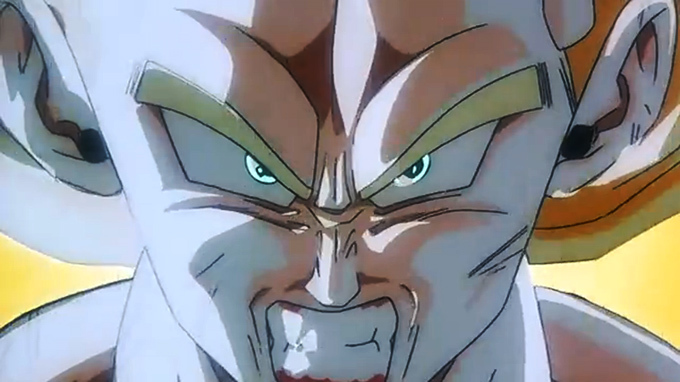 His face contorts with intense focus and rage, while still managing to sustain the Genki Dama. 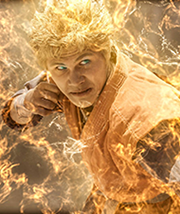 Simply the energy radiating off of his body is enough to destroy almost every piece of matter around him, including the Artificial Human whose attempts at striking Goku prove all too fruitless, as the closer he gets to Goku, the faster his body is disintegrated at the microcosmic level. 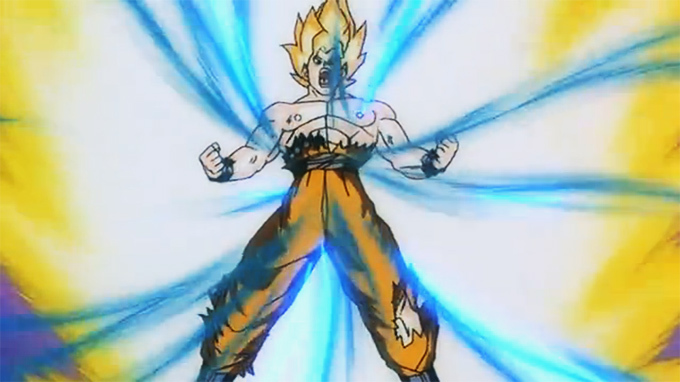 Goku then punches through his chest and the Genki Dama’s energy makes his body explode. 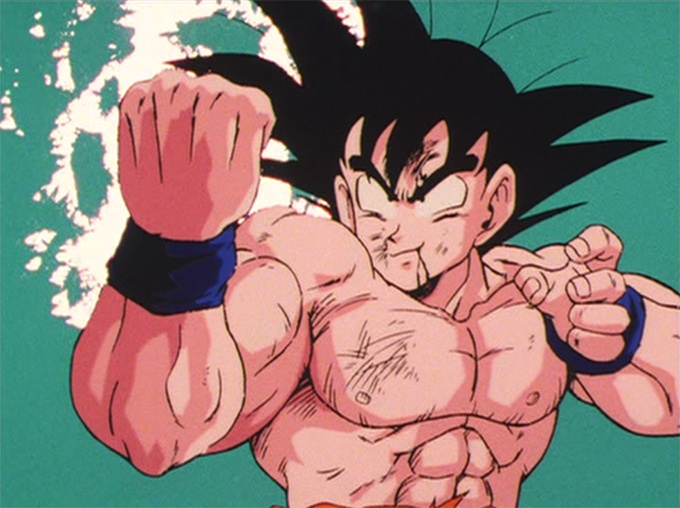 Eventually Goku is able to expel all of the energy and successfully regains his composure. 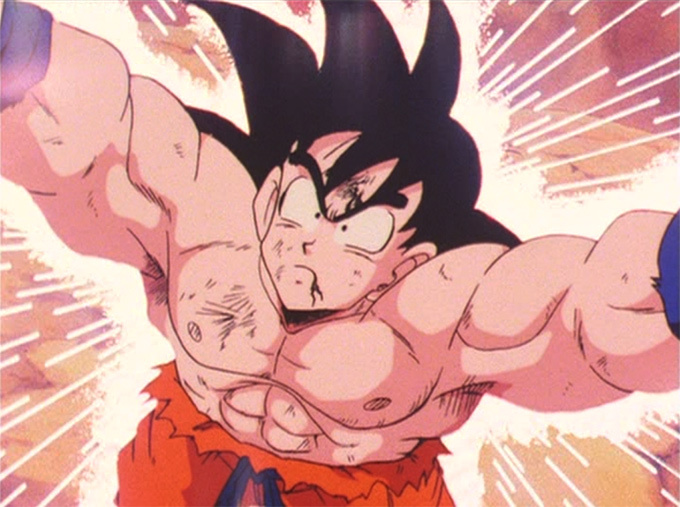 Many fans disregard this scene because it is a non-canonical film, but I think it’s a really great exploration of Goku’s abilities and limits. It makes me wonder why Goku didn’t always absorb the Genki into his body to become an unstoppable tank of righteous, microcosmically dense energy, incapable of being defeated because no matter can become more subatomic than his own. He could surround himself with this Genki energy and use it as a shield, or use it to power his own movements and become incredibly strong or fast. There’s no telling what else he could have done with that much Genki if he really wanted to try. Alas, it’s probably because he only used the Genki Dama when he absolutely had to, and refused to borrow Genki from other living beings just so he could experiment and develop new techniques. It’s a case of Good Guy Goku. I’m sure Vegeta would have been more than happy to experiment. And despite Goku’s otherwise kindhearted nature, he never teaches the Genki Dama to anyone else. Or the Shunkan Ido for that matter. You’d think he would have taught Gohan while they spent a year in The Room of Time and Space training for their battle with Cell. But no. So there you have it. The Genki Dama fully explained. Now you know where the idea for the Genki Dama originates, can see it’s cultural roots in ancient Daoist mind-body exercises, and even modern Qi Gong practices. The Genki Dama is a profound technique. Its signature appearance represents a lot more than a mere martial arts move, and has even become a cultural icon representative of hope and the collected will of the world’s people. The next time you see Goku use the Genki Dama, try to remember this article and recall the rich cultural context that Toriyama makes look so simple.